Cricket has announced two new Android smartphones, one from Alcatel – a manufacturer which has hit the headlines once today already – plus another from Kyocera, both of which will go on sale before the end of the month. 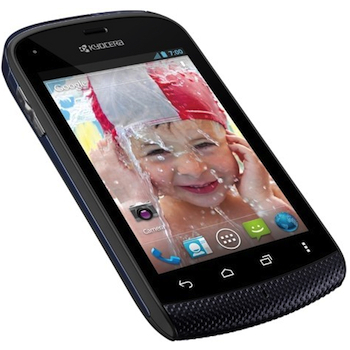 We’ll start with the Kyocera Hydro, a name which drops a hint as to the phone’s big selling point. Got it yet? That’s right, it’s waterproof, a feature which Cricket’s press release says will help stop your phone being added to the 82 million phones apparently already ruined by water damage in the U.S. It can do this thanks to its IPx5 and IPx7 certification, which provides it both splash protection and the chance to survive a 30 minute dunking. The phone has a 3.5-inch screen with a 320 x 480 pixel resolution, a 1GHz Snapdragon processor, 512MB of RAM, and 2GB of internal storage memory. This can be increased by using a microSD card, plus the device has a basic 3.2-megapixel camera with an LED flash. It operates using Android 2.3 Gingerbread, and other features include Wi-Fi, Bluetooth 2.1, and Cricket’s Muve Music. Muve Music, the streaming music service built into Cricket’s monthly plans, is also a feature on Alcatel’s One Touch Authority, the second phone the carrier has launched today. It’s a step up from the Kyocera Hydro, and boasts a 4.3-inch screen with a 480 x 800 pixel resolution and Android 4.0 Ice Cream Sandwich, all powered by a 1.4GHz processor. There’s a 5-megapixel camera on the rear along with a video call lens around the front, plus it has DLNA connectivity. Cricket will relieve you of $250 for the One Touch Authority when it’s released on January 20, while the Kyocera Hydro (pictured above) is yours for $140 five days afterwards on January 25. Both phones have been around for a while, with the Hydro first appearing in mid-2012.